Attempting to work through some more of my backlog... so much stuff I want to post! Anyway, Nicole has a few new things for Winter. First, they're doing glitters- woot! Glitter! Two 'new' ones (I think the new ones were actually from Fall) and two re-promoted ones. Imagine If.... from Spring 2009. Light silver scattered holo. You're A Star, also from Spring 2009. A very sparkly white/light silver/iridescent pearl particle shimmer. Let's Get Star-ted (over BB Couture Mendocino Midnight). I love these types of polishes that have the fun shaped glitter. It has pretty pastel opal glitter and holographic purple stars in an ever so slightly purple-tinted sheer base. The trick to applying these is to lay down as much of the base glitter as you want- this is one coat, two coats adds a little more sparkle. Then, with a toothpick or cuticle stick or whatever you have handy, fish out the stars and place them on the nails as you please. Usually I can just dip the toothpick in and two or three stars will stick to it, you may have to tilt your bottle and pick them out if you've already used a lot of the stars. I swear I took a picture of this over a yellow creme but I can't find it at all... But it looks even better over bright yellow creme. 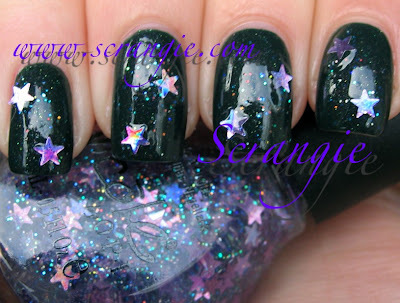 Sprinkle of Twinkle (over BB Couture Mendocino Midnight). A clear base with large hexagon-shaped hologram glitter and small round silver glitter. I wanted to try this glitter over a few different finishes, so here it is over a glitter/shimmer. Pretty nice. The glitter stands out a lot on such a dark background. Look at all that holo in the bottle! Sprinkle of Twinkle over Diamond Cosmetics Metallic Venom. Here it is over a frost. Definitely takes the eye away from all the frostiness. Sprinkle of Twinkle over Diamond Cosmetics Froggy. Here is is over a creme, and a neon creme at that. I like the way this one turned out the most! And somehow, the glitter makes it easier for my camera to pick up the neon base color. Crazy! This is one coat in all three pictures. It's very similar to Winter Glitterland, but it lacks the golden champagne tint. This is just straight silver, no tint at all to the base or the glitter. Dash Into The Dark. A very dark vampy purple, along the same vein as Lincoln Park After Dark. This is two-ish coats (more on that in a second). The color starts out as a deep eggplant colored translucent gloss (almost a jelly) on the first coat and each additional coat deepens the color to this vampy near-black shade. Do You Deliver? Kind of a cranberry-rust shade. Man, I made a huge mess with this one. I kept pressing the button over and over going "Why isn't the polish coming out??" but I didn't realize that the polish actually was coming out... Yeah... Bad idea... don't do that! Hahaha! Close The Deal Teal. My favorite out of all of them. This color is gorgeous! It's a medium blue-teal shimmer. Pretty simple but so pretty. I'll be keeping this one in my purse for sure. Express-ion Of Love. This one surprised me. It's a pretty hot pink jelly. Not super super bright, but really fresh looking. Reminds me of candy. This was the easiest of all the shades to apply. Snow Time To Wait. Pure white. 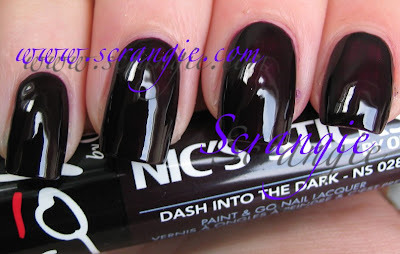 This one was the most difficult to apply and I used topcoat on this shade because it really needed it. You can see the bald spot on my nail from where I accidentally wiped off the polish. This one is really good for french tips, if you're into that sort of thing. Because the brush is so big, it was really easy to just do one swipe across the tips and get them pretty crisp. These are a little tricky to apply. I don't think I quite have the hang of it yet. The polish in these pens is very different than regular polish in a bottle. This polish has a very thin, slippery texture, almost as if it's water-based (I don't know really, I didn't actually look at the ingredients). My suggestion when applying these is to get as thick of a coat onto the nail as you can manage for the first coat. I did coats that were really thin and I think that's why I needed to do a second coat. For the second coat, get a ton of polish onto the brush (by pressing the button) and very very very gently and lightly dab it onto the nail if you can. Applying a second coat too roughly seems to wipe off the first coat, as you can see in some of my pictures. I need to practice more with these. I did notice that these have a very low amount of polish smell. I can't smell it while I'm applying it and really only smell it if I hold my wet nails by my face. Stealthy. Oh the polishes in pen look amazing, especially I like the hot pink polish, it looks so shiny! Thanks Scrangie! I appreciate all the time and effort you put into this blog. And thanks for the tip about the star glitter - I will definitely be trying that. If I ever spot Imagine If... or Let's Get Star-ted they will be mine! Argh I must get Let's get star-ted. I love love love funny shaped glitter! darn! just when i was at peace with my nail polish collection... lol! i think it's genius to put them in pens. and does not smell? wow. my hubby will love that (he hates it when i apply polish when he's around, he says the smell gives him headache haha). hmn... must find a way to try them hehe. WOW!welcome back to posting like a badass. Gorgeous. Do You Deliver? polishes in pen definitely is pretty!!! Wow- the polish oens came out very shiny! I'm going to pick one of these up to test the brush you speak of. My verification word is "spent" as in..."I spent all my money on the polishes I saw swatched on Scrangie's blog!" Hey, that is something different by Nicòle! Cool! "Imagine If.... from Spring 2009. breathtaking!! i love it. yours always look so perfect.. jealous! They are all gorgeous! I bought Sprinkle of Twinkle in the fall, and wore it over SH Celeb City, for a silver glitter over silver foil look for New Years. It was a perfect combination for the evening! 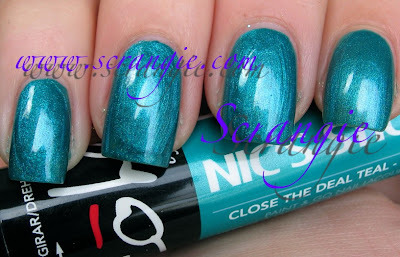 Nicoles are always in stock at the large Shoppers' stores in Canada, so any Canadian readers should check there first. Lovely swatches as always, my dear! These are all beautiful colors! How do you get the pens to looks so good, there is always a mess on me after I use them! My four-year old cousin asked for nail polish for Christmas and recieved a Nic's Stick (a pink shade, I don't know what it's called) and she managed a full manicure in a moving car better than I could with a normal polish bottle and being still. She must be related to Scrangie. What you said about the polish pens is also true with the sally hansen nail polish pens that I got over the summer, FYI! Thanks for posting - I really appreciate all of your pics! i can not get the hang of applying those... every time i try to use mine i end up removing it and using regular polish! pretty colors, but totally not worth the hassle!! !